Lakeside Crossing is a new, $25 million boutique retail complex that includes over 32,000 square feet of upscale restaurant & retail space in the heart of Central Florida's esteemed Winter Park. The development is in an urban environment, so there was no land available for an surface retention pond. Engineers at Kimley-Horn and Associates looked to Contech to help design an underground solution capable of capturing the required stormwater storage volume. 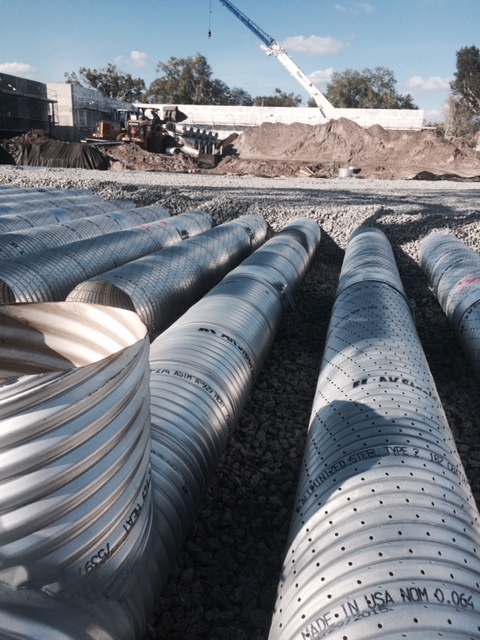 Contech designed a system made from 4,500 linear feet of 24" diameter, perforated Aluminized Steel Type 2. The system was custom fabricated to accommodate light pole foundations and tree islands. The perforation in the pipe allows the captured water to be released into the surrounding soil slowly over time. The general contractor, Sitek Corporation, was able to install the system in phases to allow other portions of the project to remain on schedule.